Before heading to Georgia early one Saturday morning, we spent Friday night in Hopa on the Turkish side of the border. We flew from Istanbul to Trabzon, driving from Trabzon to Hopa, and arriving in Hopa well after midnight. 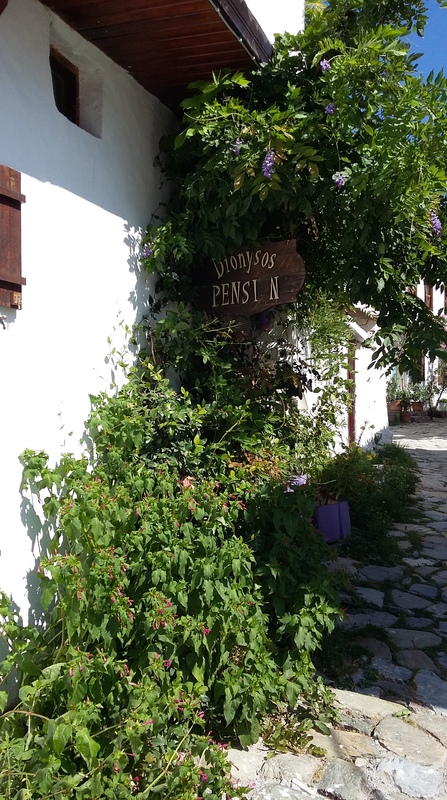 We had booked an Airbnb ahead of time for the four of us (we were traveling with another couple), and when we arrived, our hosts met us at the entrance to their village, leading the way up to their home by car. As the roads got worse, we jumped out of our rental car and into their pick-up truck to make the last leg of the trip up to their mountain home. Our hosts, Ceren and her husband, had been living in Beşiktaş (our neighborhood in Istanbul) up until a few months ago when they decided to move to Ceren’s family’s mountain home in Hopa. Their village home was the oldest one I had ever seen, and it had several rooms, many of which appeared to have been added to the main structure at later stages. 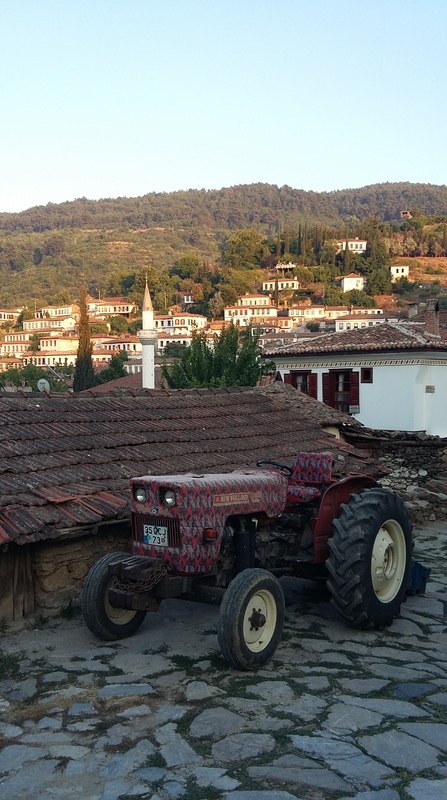 With a cozy village home set against the lush green of the mountains, it wasn’t hard to understand why they had made the move from bustling Beşiktaş to Hopa. In the morning, we were awakened with the smell of crisp, fresh air (not something that we experience often enough in Istanbul), and I rolled over to find that Gürkan was already gone, exploring the outdoors. In the small wood-stove heated kitchen and sitting room, Ceren offered us coffee and we had a chance to get to know more about their life in Hopa. She shared a story about how their two dogs who typically stay outside had opened the back door while they were away and then proceeded to track mud throughout the entire house. It had happened only a couple days before our visit so in typical village fashion, relatives and neighbors had come over to pitch in with the cleaning. Ceren and her husband also shared some helpful info about Batumi, including the phone number for their Georgian taxi driver whom we would later get to know, even becoming guests of him and his wife in their home in Batumi. After coffee, we ventured outside to meet the mischievous dogs, and took a walk through the couple’s gardens, admiring the kiwi and persimmon trees, and the rolling hills of tea bushes (this is the region where all of Turkey’s tea is grown). 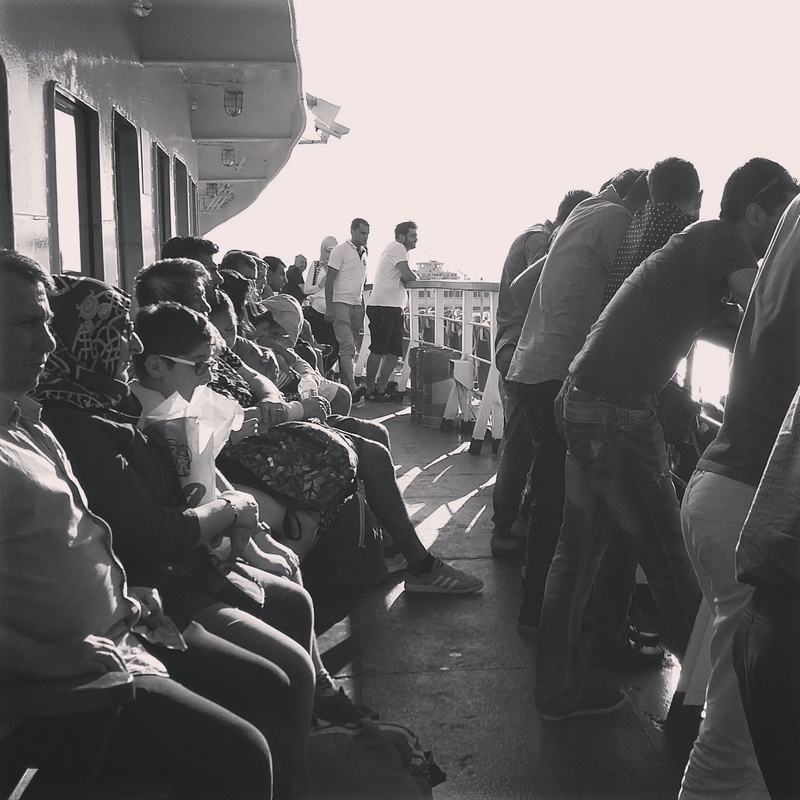 We were on a tight time schedule – we wanted to reach the Sarp border crossing before it got too crowded – so we couldn’t spend as much time as we wanted to before heading out. Ceren’s husband picked some apples for us to take on the road, and then we climbed into his truck so he could take us back down to our car. At the car, we met some of the villagers who invited us all over for tea. We politely declined, bidding our hosts and the villagers farewell, and heading off the last 20 kilometers to the Sarp border crossing. I dream about Şirince, a village I first visited in 2010. Gürkan and I were staying with a friend in İzmir and while walking through the university campus, we saw a student tour to Efes, Şirince and Kuşadası. It was dirt cheap, so of course, we took the opportunity to sign up. The tour guide and his organizational skills couldn’t have been worse, but the sights were all amazing, especially Şirince. From time to time, I google Şirince and imagine visiting for the weekend, and staying there forever (kidding, mom!). Gürkan and I had planned to stay in Antalya and Olympos for the Ramadan holiday, but it was hot, too hot. He had the brilliant idea of heading back in the direction of Istanbul a day early, breaking up the long day of driving and spending the night in charming Şirince. 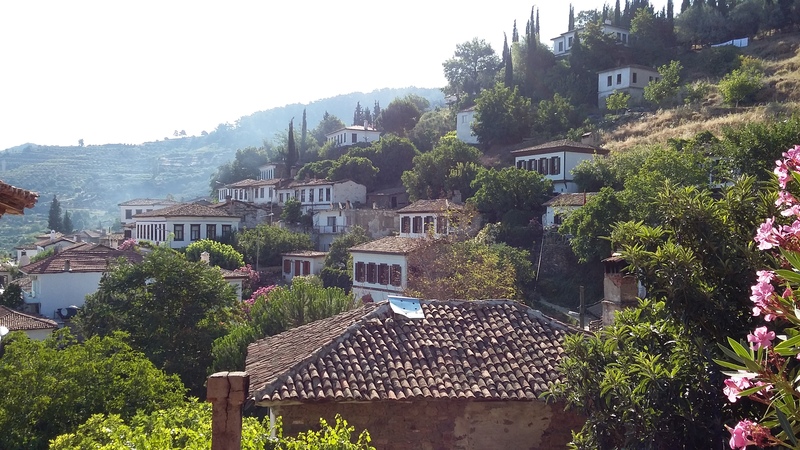 Şirince was originally home to a Greek Christian population and remains famous as a wine producing village. 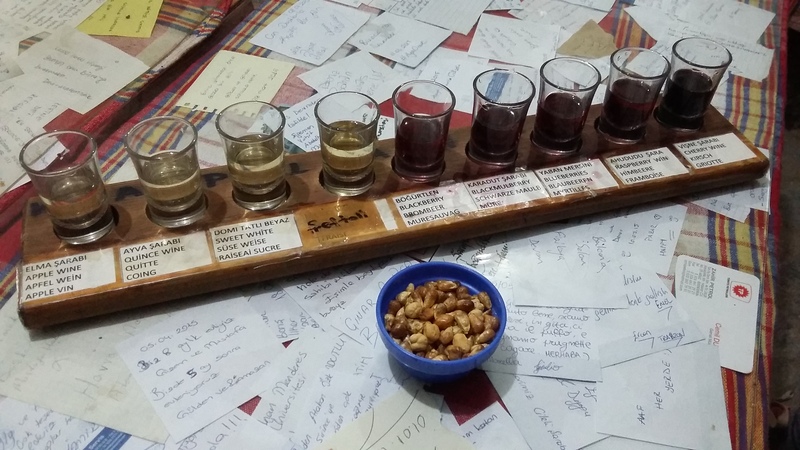 Şirince wines are most often fruit wines (think: quince, kiwi, blueberry, blackberry, and strawberry), as well as some wines made from Turkish wine producing grapes (Boğazkere, Narince). I find many of the fruit wines to be too sweet although the quince is madly refreshing on a hot summer’s day. Life moves a bit slower in the village. Roosters crow, dogs laze about on the narrow cobblestone roads, women sell spices and homemade goods, and forgotten churches lay tucked away, hidden from the main road. Legend has that the Greeks named the village Çirkince, or ugly, in order to deter others from following them there, but in 1926, the governor of İzmir changed it to Şirince, or pleasant, clearly a more aptly fitting name. We arrived at Şirince in the late afternoon after a long, sweaty (but beautiful) trip to Pamukkale. 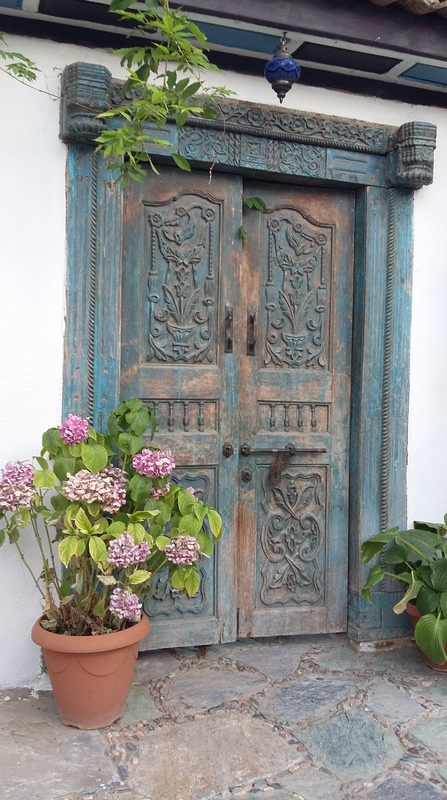 We checked into our guest house – an old Greek house – complete with fireplace, decorative wooden ceilings, and antiques. We had less than a full 24 hours to enjoy the village so we made the most of it. In the evening, we did a wine tasting at Kaplankaya wines, purchased a couple bottles to take home, and then spent the evening sipping wine on the shop’s small patio. 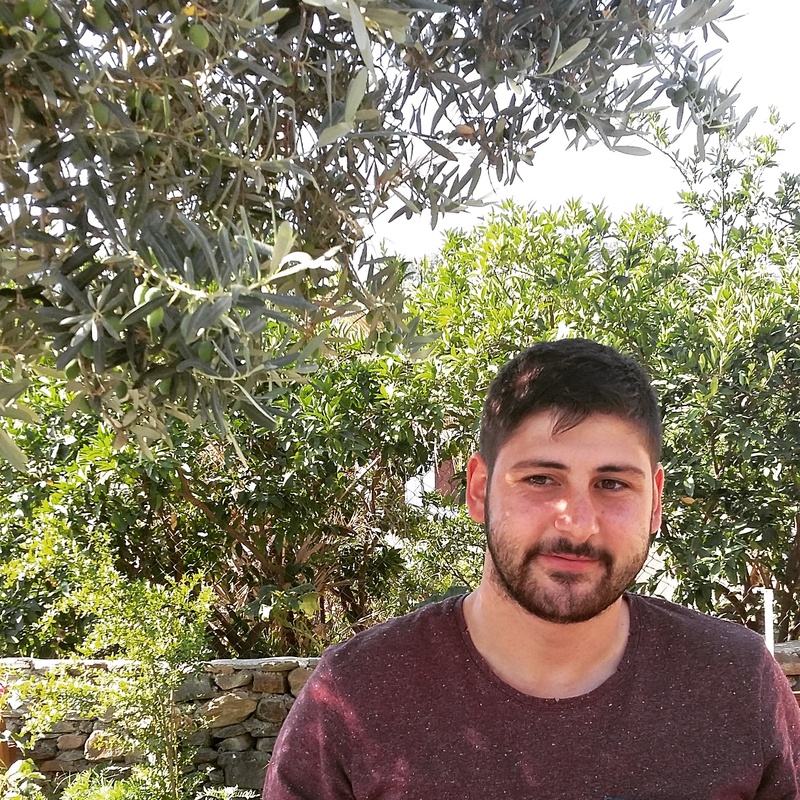 In the morning, we enjoyed an amazingly fresh breakfast in our hotel’s garden; in fact, the olives at breakfast were so good that we asked the owner where he had gotten them from. He pointed to the tree we were sitting under, saying he had picked them from there, and had processed them himself. After breakfast, we took a morning stroll through the market area. We stocked up on olive oil soaps, cold-pressed olive oil, village olives, and hand-knitted winter socks. Although we left around noontime, the long trek back to Istanbul was not completely uneventful. We stocked up on pears, melons, and homemade pomegranate molasses from roadside stands, beat the Istanbul traffic to the Yalova-Gebze ferry even though the TV stations had already staked out spots to document the holiday traffic, and found ourselves in an eerily quiet Istanbul. Luckily, when the landlord and his family wished us happy bayram, we had more than enough fresh fruit to share as our own bayram offering. A couple weeks ago during the four day Ramadan holiday, Gürkan and I took a road trip from Istanbul all the way to Antalya in Turkey’s south. After family time in Antalya, we headed to Olympos, explored, camped and swam. 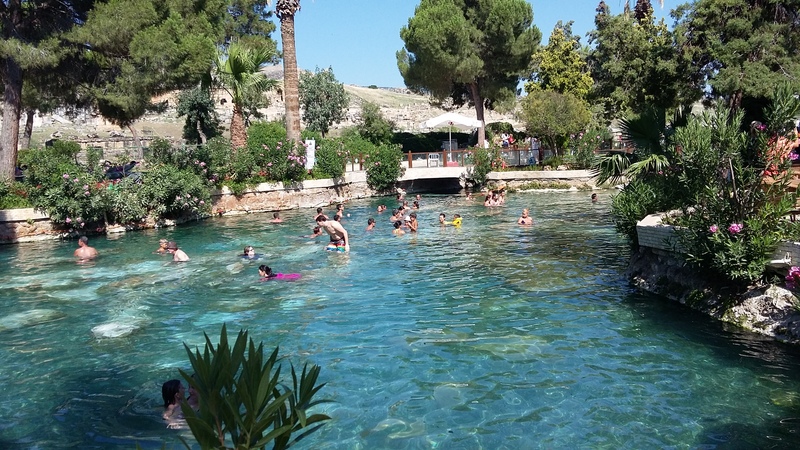 By the second day, the heat had gotten the better of us and we decided we had better head north, but not without first stopping at Pamukkale. Translated to Turkish as ‘cotton castles,’ Pamukkale is not cotton-y at all, but actually a build-up of carbonate minerals. Little did we know that there are not one, but two, entrances to Pamukkale, and when the villager pointed us in the direction of the entrance, it was slightly unsettling to find grass coming up through cracks in the sidewalk and shuttered concession stands. But the ticket booth was open and we preceded to purchase our tickets and pass through the turnstile. We found ourselves at the start of the road which passes through Hierapolis, an ancient city home to various civilizations since the 2nd century BC. The sun bore down on us and silence reigned as we walked between the ruins of countless tombs. After a mile we thought it was strange we still hadn’t reached Pamukkale’s travertines and after more than a mile, we knew something was up. The ruins came to an end, and a manicured lawn came into view and was that throngs of people we saw in the distance? We finally reached the travertines only to realize that there was a newer, main entrance where the tour buses were dropping people off. Drenched in sweat and dust, we sighed. And yet, we were finally at the travertines and how strange they were! The sun beat off the glaring white of the solidified minerals, forcing me to squint, and wish I had had enough foresight to put my swimming suit on. We slipped our feet into the milky white water, drudged up the silt from the bottom to take a closer look and meandered from pool to pool. Kids were splashing around and even the aunties had suited up to cool down. A pair of young men slathered the silt on themselves, letting it dry and crack in the sun, while a young woman forced the dredge into plastic water bottles she had brought along with her. The walkways were slippery and with the steep ledges, I felt myself catch my breath a few times, fearful of the drop below. After exploring the pools open to the public, we ventured back up to the main entrance, seeking out a cool place to rest. We found ourselves in the historic swimming pool area which although beautiful wasn’t worth the pretty penny they were charging for a dip. We grabbed several rounds of ice water and lounged in the shade. Over sips of water, we lamented about how we would have to walk back to the car. It was a godsend when we noticed there was a shuttle parked outside the pool area, shuttling visitors to the other entrance. We hopped on, and this time we sped through the ancient city of Hierapolis, jumping off at the forlorn entrance. Brushing off the dust and silt, we retired to the car, rolled down the windows as the car battled the heat, and turned west, toward the village of Şirince. 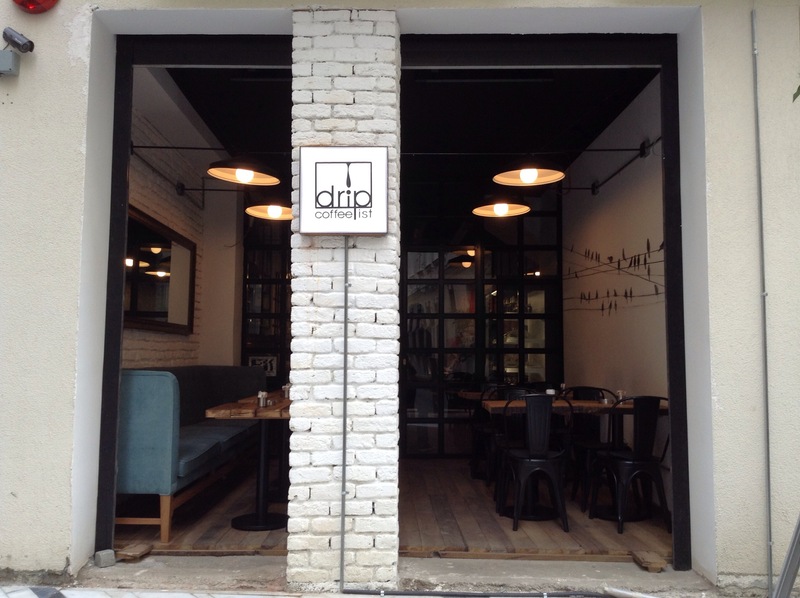 On January 3, Drip Coffeeist opened its newest location in Asmalımescit, in the heart of Beyoğlu. My first trip to Drip Coffeeist was a visit to its original location right off of Bağdat Caddesi. My friend Fatma introduced me to Drip Coffeeist’s cold drip and brownies and I was won over. A new location in Asmalımescit means all the goodness of the original location is now more easily accessible for those of us living on the European side. Drip Coffeeist’s diehard customers had encouraged, in fact, pushed the owners to open another location on the European side. 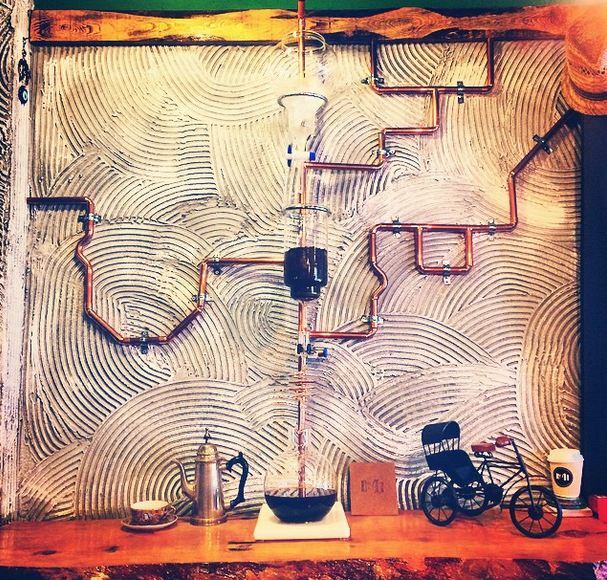 And when your first coffee shop is as successful as Drip Coffeeist’s, why not? 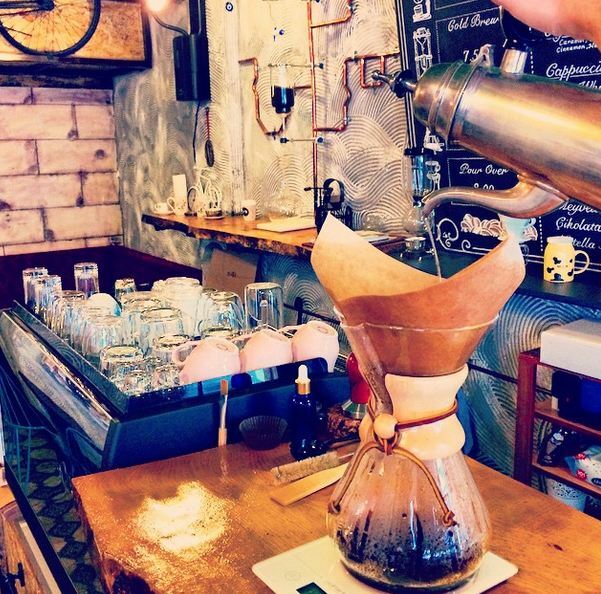 Like most coffee shops in Istanbul, customers have a variety of brewing systems to choose from, but unlike the other shops, Drip Coffeeist has perhaps the largest selection of different brewing methods. Imagine my surprise when the owner pointed out a brewing system I had never seen before. That’s right, I’m talking about the Belgian syphon, not to be confused with the Japanese syphon, which is commonly referred to as the syphon in Istanbul’s third wave coffee shops. The Belgian syphon, or Royal Belgian Coffee Maker is – like its name – very royal-looking. Unlike the vertical Japanese syphon, the Belgian one works through a balance mechanism (for the full details, click here) With a short brew time, the historical device is perfect for those who prefer a stronger body without the wait. Drip Coffeeist was one of the very first to use the king of coffee makers in Istanbul and so far, it’s the only coffee shop I am familiar with that is currently offering this brewing mechanism. In the summer, the drink of choice at Drip Coffeeist is the cold brew, and it is indeed, very good; after all, it’s the drink that peaked my interest in interviewing Drip Coffeeist. The baristas at Drip brew their cold drip in the Kyoto-style meaning water drips drop by drop down the chambers to saturate the coffee grounds (for more details, click here). The process is extremely time intensive but the end product is worth it. Bottles of freshly brewed cold coffee can be purchased from Drip Coffeeist’s cold case and taken home to enjoy. If this all seems rather overwhelming, the baristas are happy to give customers a short briefing on the various beans and brewing methods in order to help them select the best combination. While chatting with the owner, I had a feeling that if you attempted all the varieties of beans and roasting methods, you would never be able to get through them all, and yet he reassured me that after 3 or 4 tries, most people find the perfect combination for their taste. Drip Coffeeist uses single-origin beans, purchased in green bean form from suppliers in Istanbul. The beans are then roasted at Drip Coffeist’s Bağdat Caddesi location according to the particular brewing methods they will be used for. This process ensures that Drip Coffeeist controls and oversees the entire process, from green bean to the customer’s coffee cup. The best beans? El Salvador for espresso and Sumatra for brewing. So there you have it, go pick out your perfect combo at Drip Coffeeist. I tried a pour over with the Ethiopian beans and it was delish. 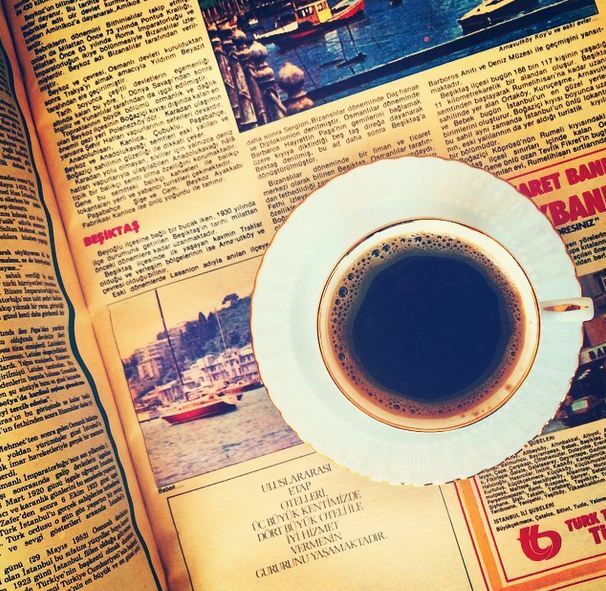 Drip Coffeeist’s Asmalımescit location can easily be reached from Tünel, Şişhane metro, or Istiklal Caddesi, and is located on the same street as the Adahan Hotel. There is no other city quite like Istanbul, but despite its aching beauty, a city of 15 million can be incredibly overwhelming. Every so often, all Istanbul residents – myself included – get an urge to escape the city to catch one’s breath and rejuvenate the soul. For me, I usually head straight to Bursa, but I was happy to change it up for a weekend in Antakya, İskenderun and Adana with friends, Nazlı and Berk. A brief stay on the Mediterranean Sea, and I returned to Istanbul feeling refreshed and relaxed with a large bag of citrus to bring some joy to the Istanbul winter. We landed in Adana early on Saturday morning and started off the weekend with breakfast at Can Cafe en route to Antakya. After an impossibly long wait, our grumbling tummies were rewarded with a spread of magnificent proportions including all the standard Turkish breakfast items, plus many more: various spiced and dried cheeses drizzled in olive oil, spicy ezme-like breakfast salads, breakfast-style eggplant dishes, and finally, tahini for the sweet tooth. We were surprised when the waitress asked whether we wanted normal tea or kaçak çay, tea smuggled from across the border. We opted for the kaçak çay which we found richer and deeper in color. After we had our fill, we headed straight for Antakya where we explored the city’s covered bazaar, a testament to Antakya’s reputation as a food lover’s mecca. Not only did we stock up on spices and the dried cheeses from breakfast, I witnessed the making of künefe, one of my all-time favorite Turkish desserts, and tasted lahmacun piping hot from the oven. In the evening, we dined at Şirinyer Balık Restoranı in İskenderun, a city once known as Alexandretta, or “Little Alexandria” as Nazlı, a Greek aficionado, patiently informed us. The selection of mezes at Şirinyer was huge and very much Middle Eastern-inspired; we opted for hummus topped with olive oil (hummus with butter was also an option), muhammara (red pepper & walnut dip), and Ali Nazik (fried eggplant in garlic yogurt, topped with minced meat). We followed the mezes with fried calamari and one large lagos fish which the waiter recommended we order fried, not grilled. A vast meze selection at Şirinyer. Muhammara is front and center. The Ali Nazik was a hit; I had only previously had it served kebap-style, but the meze version was delightful. The heat of the muhammara was deceptive, light on walnuts but packed with the red pepper the region is so famous for, the heat crept up on you when you were least expecting it. The lagos turned out to be an extremely meaty fish with plenty to go around for the three of us. The waiter did, however, look disappointed when we left the head; I momentarily felt ashamed that none of us were willing to tackle it, but as soon as a plate of fresh fruit was set in front of us, we quickly forgot. On Sunday morning in İskenderun, we had breakfast at the open buffet in one of the city’s three Petek Patisseries. We were served toasted bread topped with rosemary and drizzled with olive oil, and helped ourselves to an abundance of fresh herbs, mücver stuffed with greens, za’atar in olive oil, menemen deep red with ripe peppers, and yogurt thick as cheese. We were in food heaven, and over a glass of fresh mango juice for Nazlı and several cups of tea for me, we hatched a plan for a book together. One table from Petek Patisserie’s open buffet breakfast with fresh herbs, thick yogurt, regional cheeses, olives, and jams. A separate table offered baked goods and hot dishes. I found İskenderun to be a positively charming city nestled on the Mediterranean coast at the foot of the Nur (Amanos) mountains. Even in December, the gardens were lush with lemons and oranges, and despite the howling wind at night, the weather was perfect for a morning walk along the seaside. Christmas trees made of macaroons seemed to be on every street corner and the spirit of a Mediterranean Christmas hung in the air. The region’s diverse mix of religions and its rich history of French and Syrian influence have surely left its mark. Back in Istanbul, I returned to the hustle and bustle of the city, heaving my bag of lemons and oranges along with me, just as all Istanbulites do after a weekend in the countryside. On weekend mornings, I’m always at No. 41 Beşiktaş, a favorite cafe of mine tucked away on Yıldız Caddesi, parallel to Barbaros Boulevard and not far from Abbasağa Park. Everyone needs a coffeeshop that’s their home away from home, and for me, that’s No. 41. Even when moving from Dikilitaş to Beşiktaş, No. 41 was my anchor, with delicious coffee and friendly conversation with owners İbrahim and Kazım. There’s also a sly one-eyed cat lurking around that I’ve taken a particular liking to. İbrahim and Kazım opened No. 41 in April 2014 and it’s been a labor of love. High school friends from Afyon and later roommates while studying at nearby Yildiz Technical University, İbrahim and Kazım know the area particularly well. Their customer-base is vast including employees from nearby corporates, neighborhood families with pets in tow, foreigners grabbing their coffee to-go, and couples and groups of young people relaxing. After the marathon, I even caught a group of runners getting their caffeine fix. No. 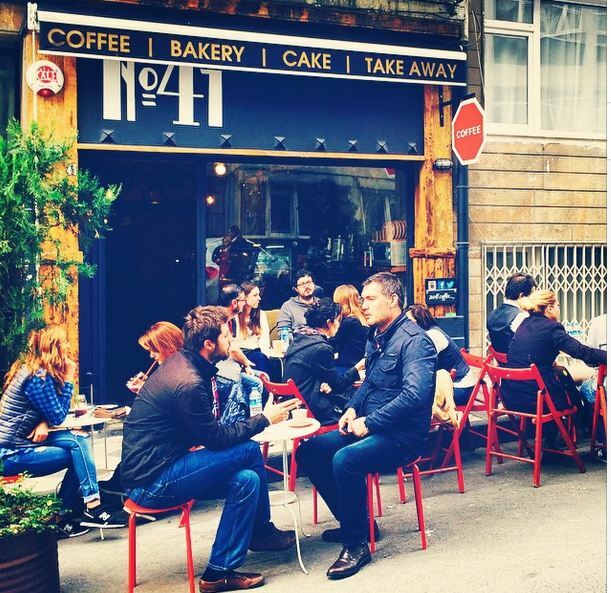 41 serves all the standards from espresso to pour overs, lattes to Turkish coffee. Customer favorites include the chemex, syphon and cortado. I wasn’t familiar with the cortado – espresso cut with milk – which İbrahim described as more sert than the latte. I gave it a whirl and it paired perfectly with the Nutella cake, my personal favorite. The cafe offers a rotating selection of boutique cakes as well as pizza every Wednesday. In the summer, you can find salads and the cafe’s signature watermelon slush, served on vintage pink plates and in mason jars. From concept to execution, İbrahim and Kazım have done it all themselves and are very humble about the talent and passion they have poured into No. 41. The design and decor are the work of their hands. They set the vibe with a great music selection, sometimes Bon Iver, sometimes old school jazz, sometimes French, but always, very, very good. And, since it’s just İbrahim and Kazım working the barista bar, you can always be sure you’ll find one of them at the cafe. The two make a point of remembering their customers and catching up with them even when their Turkish is dismal like mine (& for that I am very appreciative!). İbrahim describes the cafe as a samimi bir yer with arkadaşlık sıcak. In other words, you know you’re in good hands when warm friendship is at the core of the owners’ philosophy. 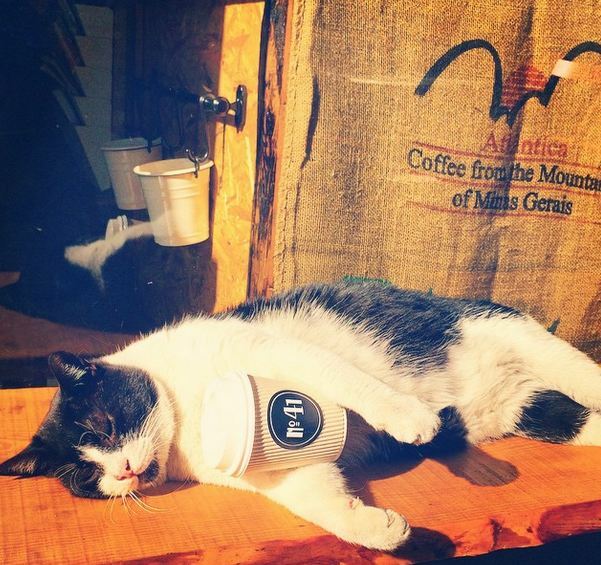 The one-eyed cat sunbathing after a coffee binge. No. 41 has an amazing social media presence so be sure to check them out on Instagram & Twitter. Get off at the Yıldız University bus stop, walk up the small flight of stairs to the large veggie/fruit stand, continue down Yıldız Caddesi and you will see No. 41 on your right. If you don’t mind hills, get off at the Barbaros Boulevard bus stop, and walk up the incline directly to the right of Cheya Hotel until you get to Yıldız Caddesi, then turn right onto Yıldız Caddesi and you’ll find yourself in front of No. 41. The cafe is also easily accessible from Abbasağa Park, just follow Yıldız Caddesi. If you hadn’t guessed, No. 41 refers to the cafe’s street address. There’s also a great sahaf (second-hand bookstore) across the street with early editions of Turkish classics and ephemera. Weekday hours: 8 a.m. – 7:30 p.m. Weekend hours: 9:30 am – 7:30 p.m.
All photos used with permission of No. 41. 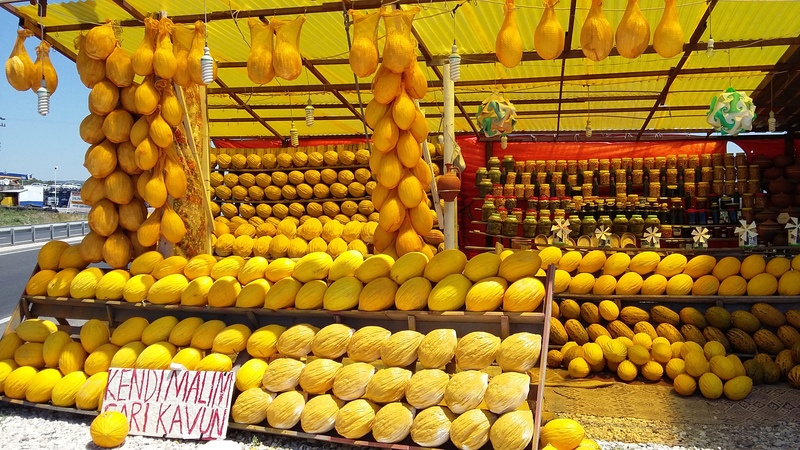 I’ve been sharing a lot of fun and quirky articles this past week about Turkey in Turkey. If you missed them, check out Why Americans Call Turkey ‘Turkey‘ and What’s the Word for Turkey in Turkish. Instead of heading out to one of the city’s swanky hotels for Thanksgiving, we decided to pull together a potluck Thanksgiving dinner with American colleagues from work. After several trips to Macro Center for supplies and a few nights in the kitchen, I finally pulled off the two dishes I was responsible for – deviled eggs and green bean casserole (next year, I want to make this cranberry sauce with figs). I substituted Ayşe Kadın beans for İzmir fasulyesi, the type most similar to American string beans, since the haricot vert style were nowhere to be found in my neighborhood. The turkey was prepared by Macro Center; they had accidentally given away the turkey my colleague had reserved and in order to make up for it, they cooked and delivered a turkey just in time for dinner. If you are heading out for turkey in Turkey, be wary of the hotels’ Thanksgiving dinners. Last year, the same group of colleagues and I went to the Renaissance and many of the dishes looked like traditional Thanksgiving dishes and that’s where the resemblance stopped. The cranberry sauce? Yeah, they were sour cherries and the stuffing nothing more than spiced couscous; they also served the turkey with the neck still on! The Conrad, however, comes highly recommended by a very reliable source so if I head out to a hotel again for Thanksgiving, that’s where you’ll find me. A great contrast, don’t you think?